Have you ever looked around and wondered why so many people live in a box? Not literally. While there are millions of people who live in boxes I’m referring to the box of the expectations of other people. One thing that social psychology has taught me is how much we influence each other. The saying, “no man is an island” actually has some truth to it. We are more productive in a community that is positive and supportive. However, sometimes it’s necessary to venture out of the community on your own. It’s easy to settle for stuff when you’re in a group of people doing the same thing. There are numerous examples of people who had to separate themselves from their peers and friends in order to succeed in life. It’s the life that 95% of people don’t want to live. They may be uncomfortable in the box but they’ll never leave because they aren’t willing to risk being misunderstood by their close friends and family. Being truly successful means breaking free of the expectations of others and competing with yourself. The 5% of people who are successful are willing to go the extra mile and do what others are too lazy, too tired, too busy, and too unfocused to do. It’s not an easy road but the results are permanent. My brother was the one who first showed me this video. I must admit that I don’t know what I would do if I was an unsuspecting patron at this coffee shop. I do know that I would lean more towards running out the front door instead of trying to film it on my phone. I think that humans in general are very curious about things they can’t explain and that’s why most customers stayed in the coffee shop to watch. It caught everyone off guard and it was apparent that most people didn’t know how to handle something that most likely they had only seen on television or in movies. I’m not necessarily against being hard on yourself. I think that striving toward a goal and challenging ourselves can be a good thing. Nonetheless, having a good cry can be a way to release some tension. I think more women than men might be more comfortable with this but the truth of the matter is that you can acknowledge your feelings when you cry them out instead of keeping them in. 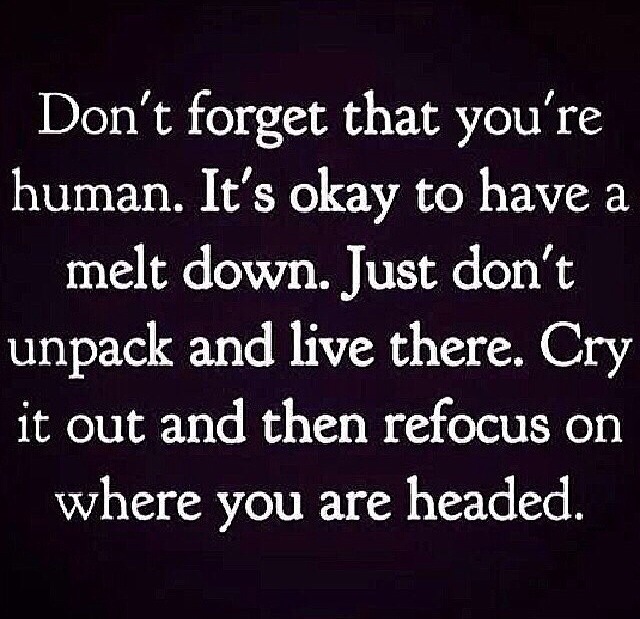 I’m definitely talking to myself as someone who really isn’t a “cryer.” I love this quote because it’s a reminder that it’s easier to move on when you can acknowledge how you feel. And crying can be a part of that process. I think that almost everyone at some point or time has read, or watched a story on television that centered around the experience of being in a blizzard. Being from the South and also due to mostly mild winters, I had escaped the experience until a few days ago. There are hundreds of rules about what to do when you’re driving in winter and the things that you need to bring along with you and store in your car in order to ensure survival. These rules are all fine and dandy but unfortunately they were disregarded because it was the freaking middle of April. Winter is supposed to be over by this point. The days are getting warmer and snow is melting. Not this weekend. So my friend and I picked the route to drive because we were trying to dodge a severe weather system in Oklahoma and Texas that included a very high chance of tornadoes. Trip started off great. Warm weather (100 degrees) and sunshine. Gradually clouds started to appear that were darker in color. As the sun was setting it started to rain and become extremely windy. This rain continued and then turned into snow. The wind picked up to the point that it was dangerous to drive. The snow was coming down fast and the wind was making it impossible to see more than five feet ahead of the car. Unfortunately we were in the middle of nowhere. Literally. With the nearest town being 60 miles away. The temperature is dropping and we don’t have proper shoes, coats, water, food, or even flashlights if we were to get stuck. There are no houses nearby and even if there were, being in a white-out makes seeing anything else beside blinding snow impossible. It was then that we realized that if we were to stop our chances of surviving in freezing temperatures without any proper equipment and no cell phone signal was pretty darn small. There are so many stories of people who have overcome huge odds and many times their successes are due to the fact that they did what they had to do because they didn’t have a choice. Stopping on the side of the road would have been a very bad decision so we had to press on. And press on we did. Very slowly and carefully. It was like driving while blind. Horrible horrible horrible. But (thank God) we got through driving 60 miles in blinding snow to the nearest town and stopped for the night. I say all this to say that blizzards aren’t any joke. I have absolutely no desire to ever be in one again and I hope to move to warmer regions where snow is very rarely (if ever) in the forecast. It seems as if all my trips these days are a challenge against logistics and timing. One thing that I’m happy about is the fact that I am traveling more–as I have vowed to do this year. One thing I especially like to do is visit the Southern states. So I made a “quick” 14 hour (one way) road trip down to Dallas and it’s been so nice. It’s interesting how different various regions of the States are so different from each other. I love laidback formality of the South and just the overall feel. One thing that has been fun during this trip has been people-watching. It’s interesting how one’s standards of what is attractive can change based on who they see around them on a frequent basis. I’ve definitely noticed this myself. It’s been an awesome time, and as usual, I’m dreading the long drive back and am already plotting ways to catch up on the sleep that I’m lacking at this point. It’s interesting how feeling so exhausted can also be exhilarating due to the thrill of a new place. However, life does go on and it’s important to remember to stop and smell the roses at time. Reuniting with old friends and getting away from routine can be rejuvenating–and in my case it’s that. Can’t wait to do this again. This article really caught my attention because it discusses a relationship between selfies and mental illness. There’s a story of a young man who actually attempted suicide because he could not take the perfect selfie The thing with social media and selfies is that you automatically get validation from all the likes and double taps. Therefore, when you post something that nobody “likes” or “double-taps” you feel some kind of way. There’s so much work that goes into getting into the right lighting and putting the camera at a certain angle to capture your “good” side. It’s the epitome of self-absorption. Especially in large doses. We’ve all known someone who is prone to post pics upon pics of their life and unless their life is actually interesting, it quickly becomes annoying. I would bet that pretty soon there will be a diagnosable “selfie disorder” that mental health professionals will be using in the next few years. Disclaimer: this post probably has nothing to do with what the title implies. One of the memories of being a teenager that stand out to me is the occasion of where I learned to drive. I remember studying for my driver’s test (the written portion), failing it and then passing it the next day when I went again. Driving for me was somewhat of a birthright. As the oldest child, my parents were anxious to have another driver to shuttle, run errands, and occasionally to help on some road trips. However, in order to get full driving privileges I had to learn how to drive a standard transmission. Anyone who has learned how to drive a car with a standard transmission knows that it is truly a process of jerking and stopping. Driving up a hill is one of the hardest concepts to learn because it requires a certain level of finesse. You need just enough gas to get up the hill and the clutch for control while not running into the car in back or in front of you. 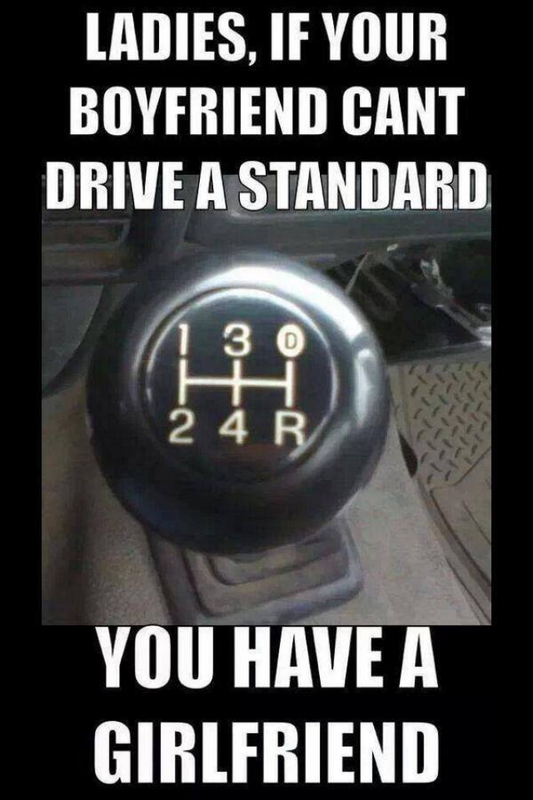 I chuckled when I saw this picture because while driving a standard transmission is a great thing, it is not a test of manhood. Driving a stick shift car is something that seems to be fading into obscurity. I meet more and more people who have no clue on what needs to happen in order to competently start and drive a stick shift. I find that driving a stick shift has helped me be able to multi task at times. Maybe not in a good way. The truth of the matter is that stick shifts require practice in order to drive. Period. However, it’s a great skill to have because you never know when it might come in handy.